Another street, another street light. This is from Katara, the cultural village in Doha, Qatar. Katara is the ancient name of Qatar. Finished in brass, the lamps look fabulous. The streets would look even better if we can get the cars out of the way. The series of carpet-themed boards seen in the background form the perimeter walls of the artificial sand dunes being constructed. Katara is a fabulous place to hang out. It houses some of the best restaurants of Qatar. If you like Mediterranean food visiting Khan Faroukh, the Egyptian restaurant, is a must. 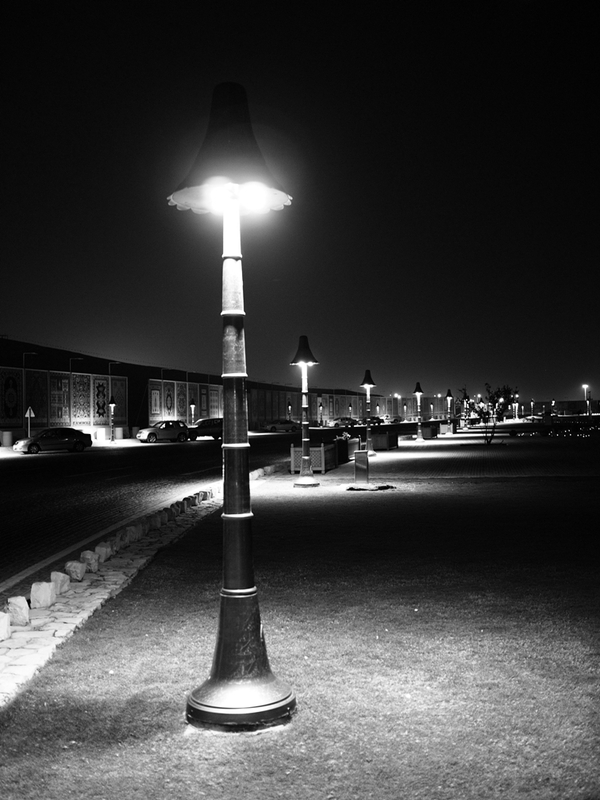 The paved corniche is a fantastic place to have an evening stroll. Katara also houses quite a few fine-art galleries. There is always some exhibition happening. It is also home to the Qatar Photographic Society. The image was shot with the Olympus E-p1 and Panasonic 20mm/F1.7 lens, a great combo. The body-based image stabilizer of the Olympus suits the lens very well, particularly for low light night photography. Converted to b&w using GIMP. I split the image to RGB layers, got rid of the Blue layer, and moved the Green layer up to become an overlay for the red layer with opacity adjusted to taste. I could have played some more time to adjust the contrast and levels, but cut short dabbing with the image to post it soon! I just fiddle with an image just enough to get the desired look, otherwise you can spend the whole evening with a single image.